Acupuncture in the Treatment of Foot Pain – Plantar Fasciitis, Heel Spur, Morton’s Neuroma… After centuries of having been used in Asia, acupuncture therapy is now an important part of the Western treatment for treating pain. In the USA particularly, it is now in its fourth decade of being sought for chronic health problems, those that have not been solved by means of conventional medicine. Thirty-eight bones, countless joints, ligaments, tendons and muscles is what makes this part of human body susceptible to injuries, inflammation and/or pain enough to undermine the individual’s performance to a great extent. Poor postures (e.g. pronation), neuroma, exercise, improper function, edema, overuse, and less-than-ideal footwear such as those that are too tight create the stress and abnormal pressure needed to cause foot pain. Although most of the patients are either elderly, women wearing high-heels, athletes not (properly) warming-up or those who have celebrated a little too intensely, it can happen to anyone anytime. Caused by small tearing and tension, this inflammatory disorder is caused at the bottom of the foot, usually under the heel bone surface. However, it can also be found in the back and edge of the heel bone. Nerve entrapment as well as pain referred from other parts of the body, its symptoms include stiffness and severe pain from few steps only. Left untreated, it can lead to degenerative morphological changes within the affected foot. Approximately seventy percent of those who suffer from Plantar Fasciitis also complain of heel spurs. When calcium deposits begin to accumulate, it results in a projection of bone from the heel. Continuous strains on the foot ligaments and muscles can be caused with exercises like jumping and running, obesity, and walking abnormalities. Mostly, there will be no symptoms. Nevertheless, chronic, dull pain while moving is often indicative. Recurring trauma tends to leave scar tissues around the nerves between toes. Excessive desk work and diabetes are some of the causes. They decrease circulation to the foot and call for the nerve to thicken when it is constantly pinched or pulled over the ligament. While some report discomfort or numbness at the toes, one sign is the pain felt throughout the nerve instead of being restricted to the impingement area. 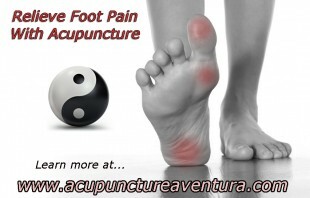 Acupuncture at our clinic in Aventura Florida has been sought time after time for issues relating to foot pain. Their are various and numerous research studies that support its use to treat various foot issues. The National Institute of Health and World Health Organization both approve of the specific styles and treatments that a certified provider uses in acupuncture sessions for the benefits of the treatment and for the minimal side effects that it produces. Acupuncture works by reducing inflammation and spasm in the area being treated. It also helps circulate fresh blood and Qi (energy) to the area while helping the body release endorphins (natural painkillers). In just a few sessions relief is usually experienced, and a small course of treatment is usually just what is needed to eradicate many problems related to the foot. Acupuncture is gentle, painless, and best of all it is effective. Start ending your foot pain today. Give it a try! Do you have any questions about foot pain and acupuncture? Feel free to contact us at 786-537-7022 to learn more and to schedule your first session.